How Do I Create I-MR-R/S Control Charts in Excel Using SigmaXL? If the within-subgroup variability is much smaller than between subgroup, the classical X-bar & R (or S) chart will not work, producing numerous (false) alarms. The correct chart to use, in this case, is the I-MR-R (or S) chart. 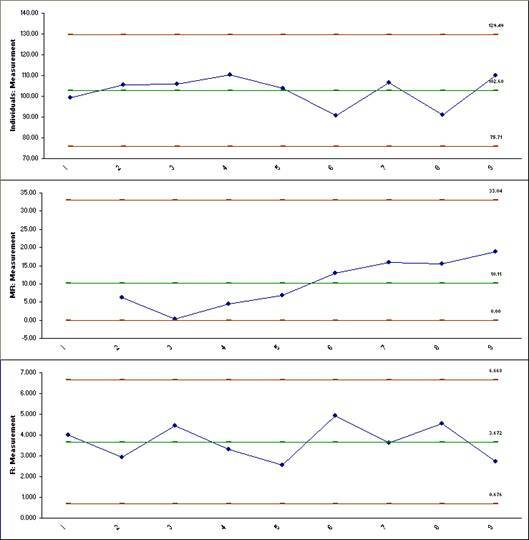 The subgroup averages are treated as individual values (I-MR) and the within subgroup ranges are plotted on the Range chart. Open Multi-Vari Data.xlsx. Select Sheet Between. We saw this data previously using Multi-Vari charts. First, we will incorrectly use the X-bar & R chart, and then apply the correct I-MR-R chart. 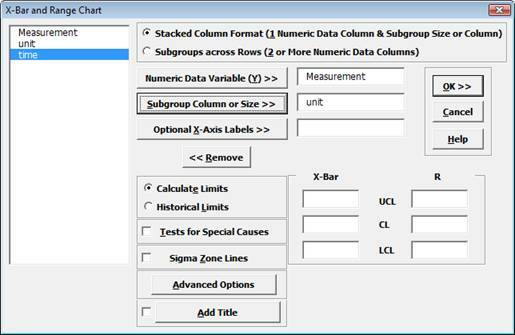 Click SigmaXL > Control Charts > X-bar & R. Check Use Entire Data Table. Click Next. Select Stacked Column Format. 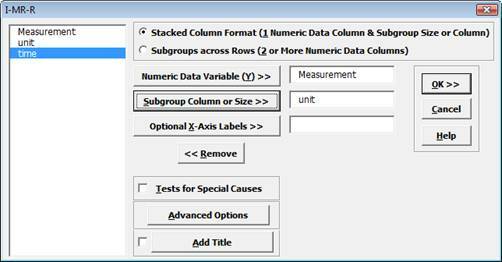 Select Measurement, click Numeric Data Variable (Y) >>; select unit, click Subgroup Column or Size >>. Almost all of the data points in the X-bar chart are out-of-control! This is due to the small within-subgroup variability (the control limits are calculated from the within-subgroup variability). Click Sheet Between. 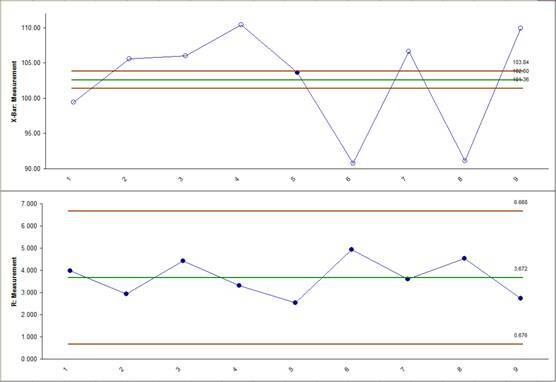 Select SigmaXL > Control Charts > Advanced Charts > I-MR-R.